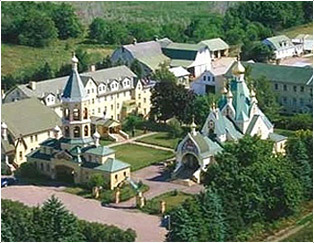 The Monastery experienced a spiritual blessing on the eve of the Nativity Forefeast. On Saturday evening and Sunday morning his Eminence, Archbishop Gabriel presided over the divine services, greeting everyone on the future feasts of our Lord’s Nativity and Theophany. On Sunday evening a general matins was served in honor of the Forefeast and St. John of Kronstadt. Immediately following the service the abbot, Archimandrite Luke, tonsured Novice Lev (from Russia) and Novice Angelos (from Scotland) as rassophore monks. I want to congratulate you, Fathers, on receiving the grace of the tonsure into the rasson and the kamilavka. Stand fast in the struggle. Before you is spread a festive banquet, a banquet of monasticism. The Lord invites you to this feast and all you must do is accept the invitation. Everything is prepared for you. All that you need for your salvation is here in our monastery, but you must take advantage of all that is available. No one will force you. You must freely use all the possibilities for your salvation. Many claim that things are difficult, that there is pain, suffering, and problems in the monastic struggle. But how can that be when our Saviour says, “My yoke is easy and My burden is light?” Is this not a contradiction? How can this be? I believe the issue is contained in one short phrase, “I want!” We frequently want that which is not good for us, or we want that which is useful but not in the correct spirit. What does the Lord want from us? He says, “Man, give Me your heart!” How can we do that? We do this by coming to Him with our pains, suffering, and problems, which by the way are mostly of our own doing, and giving them up to Him, over and over. I would ask all of the brotherhood, the seminarians and faithful here gathered to offer up their prayers to God for the salvation of our newly-tonsured fathers.